Growing up, we had a beach house in Ocean City and most mornings Dad was in charge of breakfast. This was decades before I realized I should be eating Gluten Free so we had pancakes, pork roll sandwiches (another Jersey/Philly thing), sticky buns from Mallon’s…you name it. I even have distinct memories of being at my Dad’s parents beach house – Mommom and JJ and watching my grandmother make cream chipped beef. That was my Irish side of the family. Other breakfast memories include my Mother – Nonna – having a very keen sense of mornings in High School where I was ….well hung-over. She always made me special scrambled eggs. Not beaten well, so full of the “whites” which she knew grossed me out, and purposefully runny. She denies it, but I knew it was her special way of saying “I know you were out late drinking and feel sick this morning”. Breakfast memories that are not so warm and fuzzy, but really strong nonetheless. 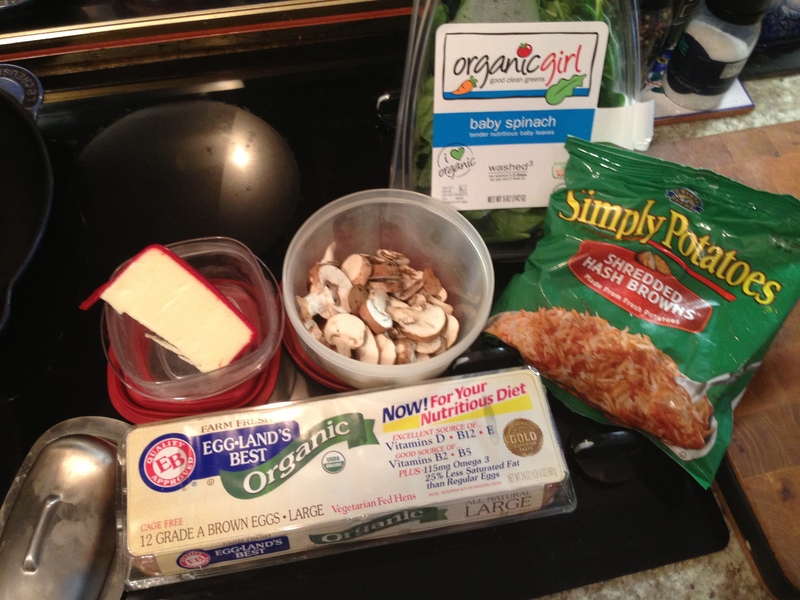 A frittata is a dish the Italians make to use up leftovers. Originally made with leftover pasta, and still is in some cases, Mom and Gram taught me that it is an easy dish that can be served for breakfast, brunch, lunch OR dinner, using whatever you have in your refrigerator. I have been making them for years and years and I have to say, not one of them has ever been exactly the same as another. It depends on what I have leftover or what I am craving. I have used everything from beans and squash to kale and prosciutto, asparagus and tomato even pasta. If you Google “frittata recipes” you will find hundreds of variations, which is why I like it so much. You can be as creative or simple as you like. So last night I looked in the fridge and realized we had very little left as Mama Sis and I are due to do the big shop tomorrow. The cheese is Fontina, and after this photo I discovered some frozen turkey sausage patties I decided to add. I turned my oven to 375° and got this frittata party started. First up the potatoes. 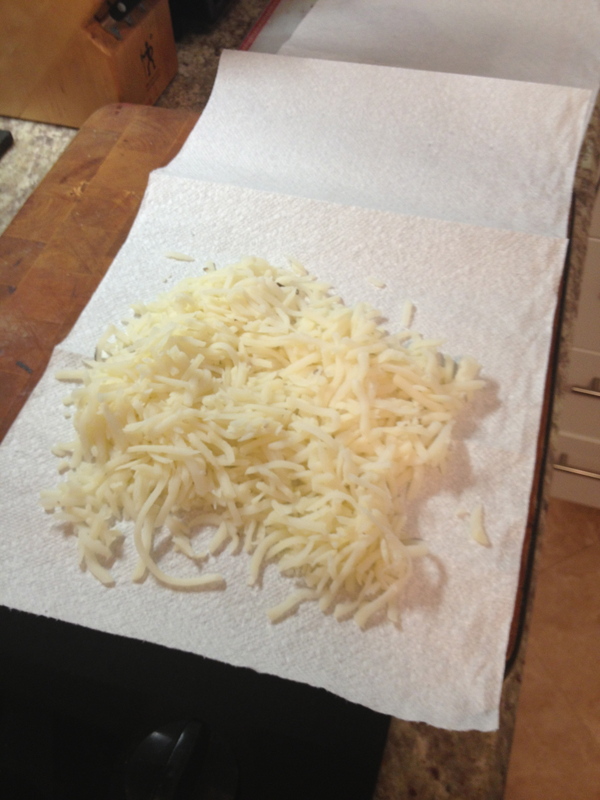 Somewhere along the way in my cooking journey / life I have learned that drier potatoes create crispier potatoes so I took the hash browns, rolled them up and squeezed them in a paper towel a few times until they were not as wet. 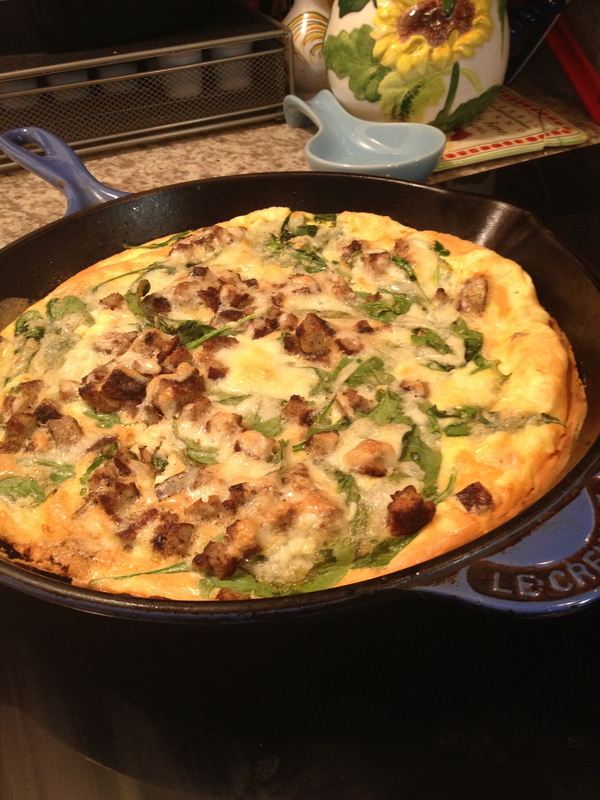 Next I got my Le Creuset skillet that can also be put in the oven, added some oil and turned the heat to Medium – High. 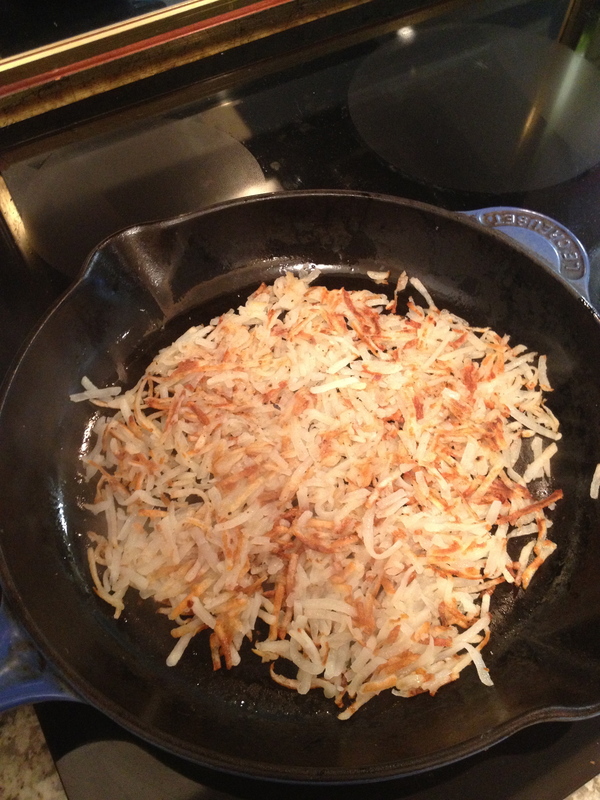 I added the hash browns spreading them out until the entire bottom was covered in a thin layer of shredded potatoes. 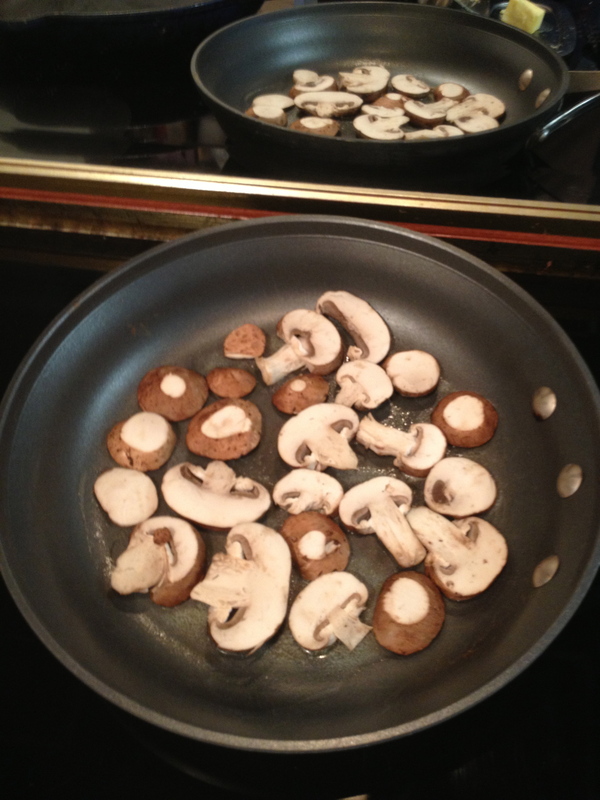 While they were cooking, be patient it takes a while to get them crispy and you DON’T want soggy hash browns, in another pan I heated up some butter to brown the mushrooms. 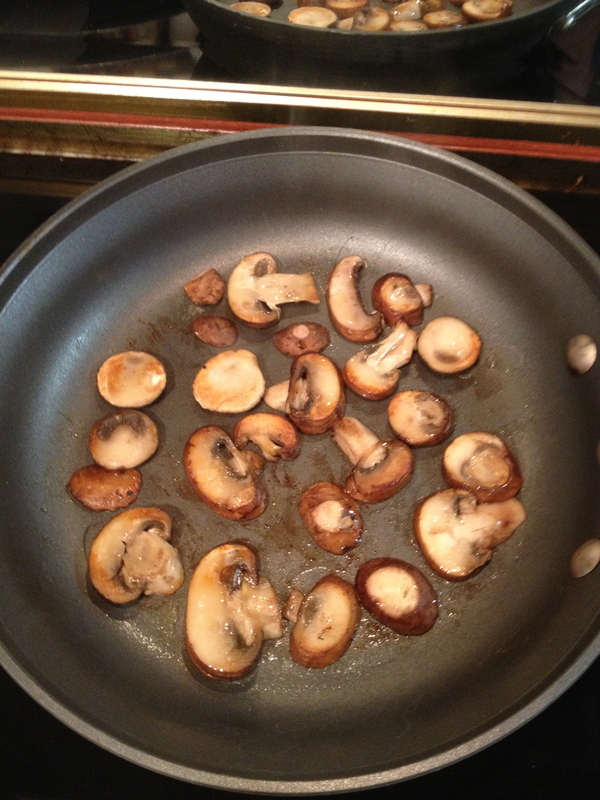 “Don’t crowd the mushrooms” (thank you Julia Child) if you want them browned. 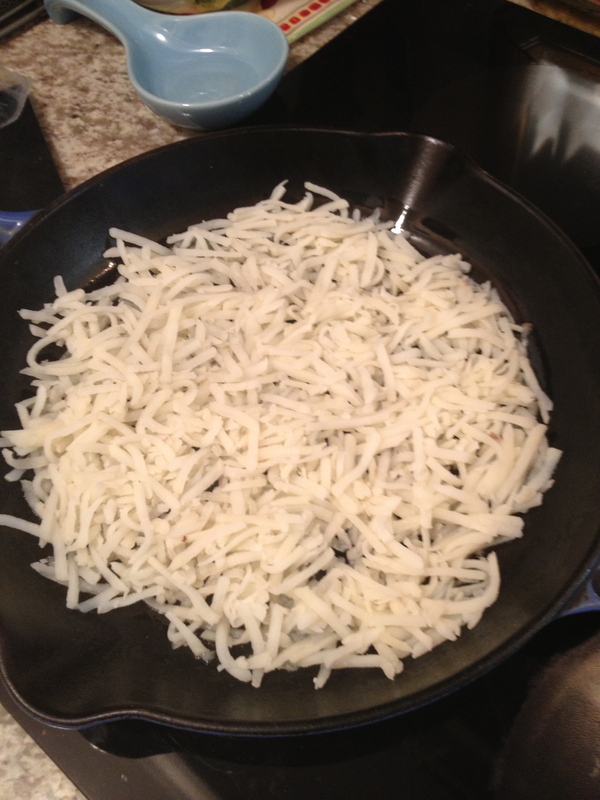 As the hash browns take some time, you can do it in batches. I did two. 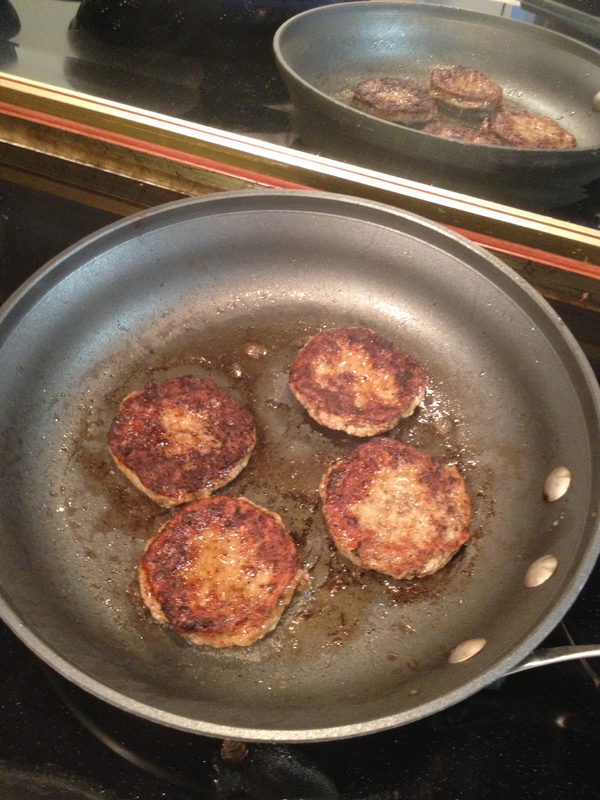 When I had them all nicely browned I put the sausage patties in the same pan and browned them up as well. After I defrosted them in the microwave to speed things up. 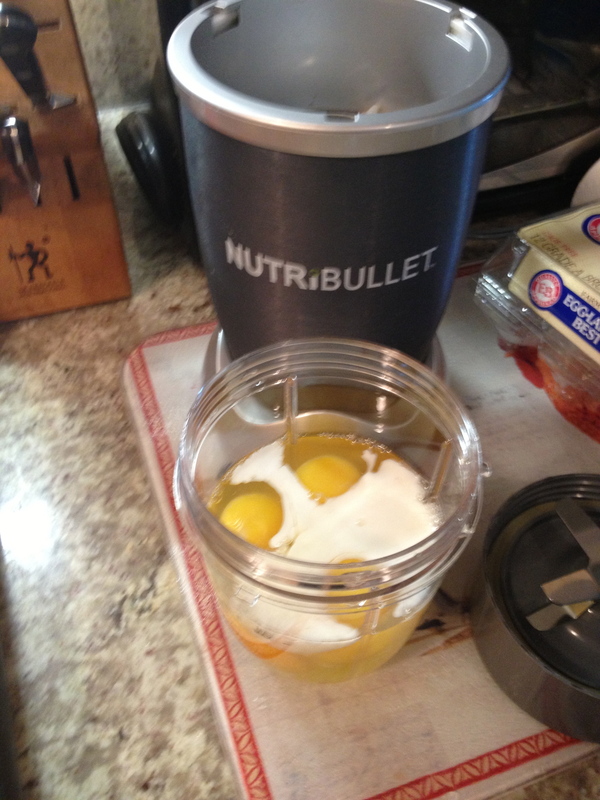 While they were cooking I took 6 eggs (looking back I could have used 8) , added a dash of milk and gave them a spin in the Nutri-Bullet. 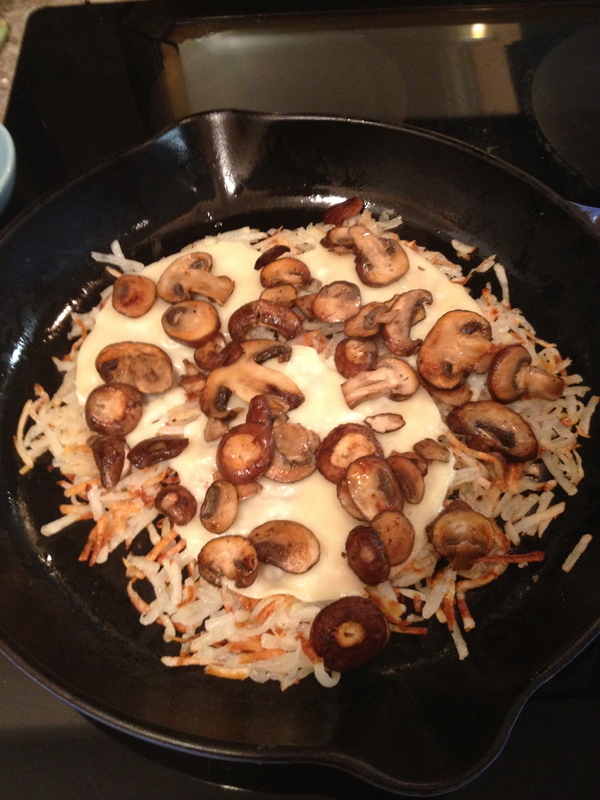 When the sausage patties were done I chopped them up and set them aside with the mushrooms while I checked on the hash browns, turning them over to let the second side get crispy. So they looked ready at this point, crispy on both sides – I think it took about 20 minutes – at this point I added 2 slices of provolone and layered the mushrooms. 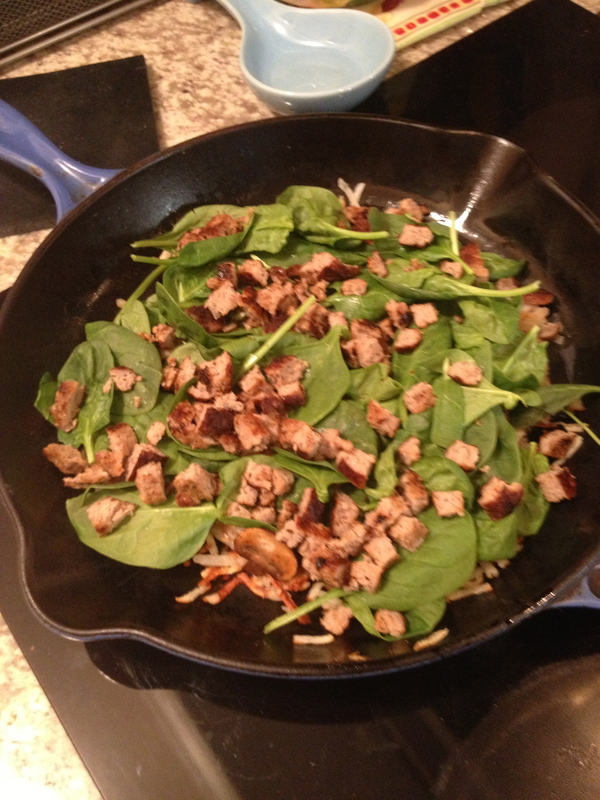 Next up was a generous layer of Organic Girl Baby Spinach, followed by the chopped sausage. I poured the eggs all over and toped it all off with some of the fontina cheese I had grated. 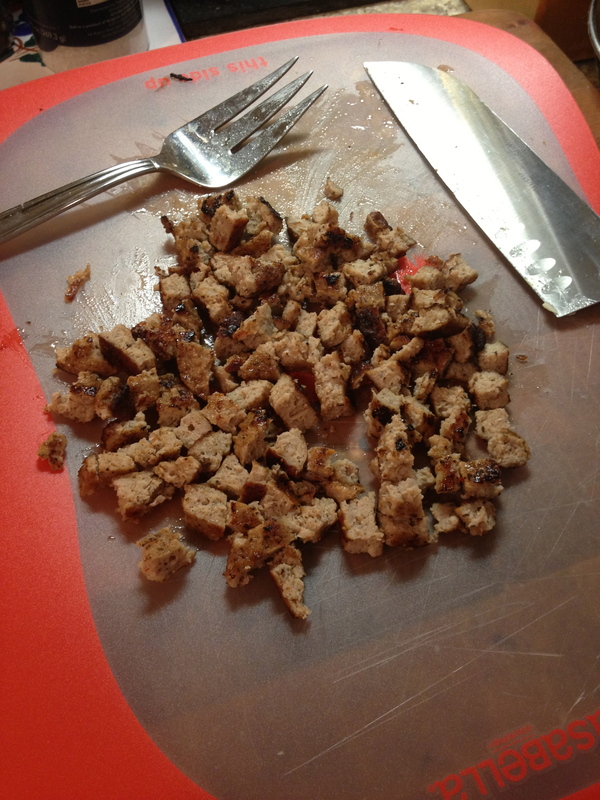 Popped that bad boy in the oven for 20 – 25 minutes ( I forgot to time it) and when it was done…. I must say it was pretty delicious. Mama Sis loved it with a little bit of Sirracha on the side – we like things spicy – and Ladybug gobbled it up. Sadly Littledude had an epic temper tantrum and wouldn’t even try it. Oh well you win some, you lose some with him and you never know what it will be from one day to the next. SO there you have it. 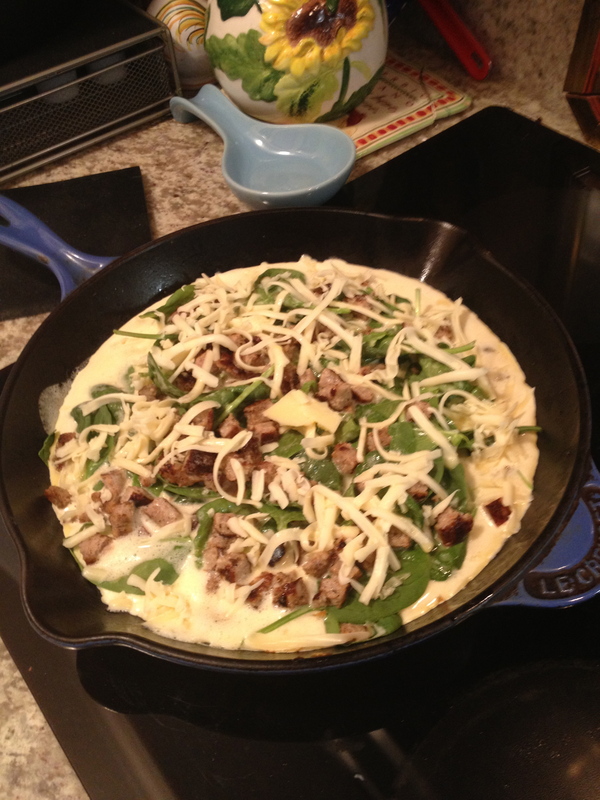 Breakfast for Dinner Frittata, easy peasy and super tasty. I do believe if Littledude were in a better mood and tasted it, he would have loved it. Ah well better luck next time. Grandmom Delia would be so proud..nothing gets throw out in an Italian Kitchen!